With the recent release of BlackBerry OS6, the upgrade rate to OS5 continues to be a bit slow. But despite all the complaints about Verizon being slow to roll out an update for the Tour, popular Verizon phones like the 9530 and the 9630 have some of the best upgrade rates. The upgrade rate on the Storm has not improved that much over the past few months. Full data below. This data came from July downloads of the popular strategy game Pixelated. 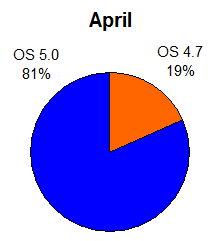 As an update to our look on BlackBerry OS5 adoption rates, in April the 9530 saw 81.4% of users running OS 5. We first looked at this issue in Novemeber and again in January. Using our data BlackBerry Cool has showed a comparison between between the first month of OS 5.0 on the Storm and on the Tour. The early upgrade rate on the Tour has been quicker, but at only 71.1% it is well behind where the 9530 is today. Meanwhile Al Sacco has acquired some data on the overall OS marketshare. While the data reflects our statistics of decent upgrade rates on the Storm and Tour, it also shows plenty of 4.5 and 4.6.1 systems still around. 44% are still using OS4.5 or earlier which means that for alot of people their operating system is over two years old, and prevents them from using a single one of our products. The adoption rate for BlackBerry OS 5.0 continues to be slower than expected. When first looked at one month after release 61% of 9530 users had upgraded to OS 5.0. An update to this study shows that the adoption of OS 5.0 is now up to 73%. Still more than 1 in 4 users have still not updated to the newer OS, and at this point seem unlikely to do so. On October 26th Verizon made OS 5.0 officially available for the Storm 9530. Simply having the a newer and better operating system available however does not mean that people will actually use it. Given that we had a large amount of data available from users who downloaded the popular Pixelated application, this was used to analyze the uptake of OS 5.0 among this population. A few notes on the sample set. Only Verizon customers using the original storm 9530 were looked at so that different roll out dates from other carriers would not affect the data. OS 5.0 had already been out a full work week before the start of this data to give a reasonable amount of time for those who wanted to upgrade to have that opportunity. Pixelated had already been available for the Storm for awhile at this point so these numbers are not skewed towards early adapters nor are the numbers skewed towards those that don’t know how to use their phones as all, as this population has gone and downloaded a third party application. Data from the beginning of the month and the end of the month were treated the same.